The perfect solution for the busy hospital, medical practice, and clinic. You may hand out the booklets for staff to read on their own or use the training tips in the Leader’s Guide for even more impact.What makes one organization better than another organization? With your experience as a customer, you can probably name several characteristics that make one company shine above the rest? These companies have a genuine interest in exceeding their customers’ expectations. They want their customers to walk away thinking how great the service was. Why Do We Need To Have Standards Of Service in Healthcare? Customer service in the Healthcare industry is finally getting the attention it deserves. Outstanding service ensures survival in increasingly competitive markets. We can’t afford to ignore its importance. The Healthcare Industry is starting to recognise the need for superior customer service. However, because those formulating policy have not considered the industry to be a ‘service’ provider, standards are way behind other service-orientated industries. This is causing (financial) damage to the Healthcare industry. Did you know that it costs 6 times more to attract a brand new customer than to keep an existing one or have one referred by word of mouth! What is Customer Service? Why is it important? Customer service is anticipating and satisfying the needs of your customers and potential customers in a consistent and dependable manner. Great service in the Healthcare Industry cannot always be gauged by the normal service measures used in other industries e.g. “fast” does not always mean “good” in Healthcare. The industry still needs to establish the indicators that demarcate good service vs. bad service. Health Industry benchmarks are needed. This Healthcare Customer Service Training Module series works towards establishing those benchmarks. We have a lot of catching up to do. Some typical situations to handle are- Calming the upset patients and families, rephrasing of the messages like ‘I am not sure how much time it will take’, ‘I don’t know’ and handling other peculiar and difficult situations. What should be the objectives of a healthcare customer service training program? · Make a differentiation between training program and other types of service interactions. · Explain the significance of positive attitude in providing the best customer service. · Enlist the benefits of providing quality customer service to both internal and external customers. It is not just what you say but how you deliver the speech is important. Good healthcare customer service training teaches you this fact and how to excel on this art. Participants are taught how to use language so that it is received in a better way by the patients and their family members. The art of saying ‘no’ in a tactful manner is taught and some supporting alternative phrases for ‘I don’t know’ and ‘this is not my job’ are taught. Not every customer is good and it is not easy to deal with difficult people. A good healthcare customer service training program should teach the participants on how to effectively interact with the customers who are angry, distraught, scared and manipulative. The various techniques of dealing with the difficult people and managing them are taught so as to deliver the highest degree of customer satisfaction and services. Healthcare customer service can lead to unnecessary stress when it comes to deal with customer needs, wants and frustrations at regular and faster rates. 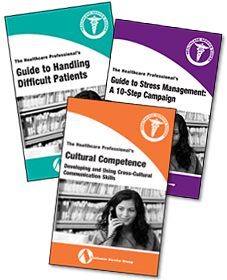 The healthcare customer service training program should teach stress management techniques which ensure that the participants stay refreshed and alert always. The various types of stress relieving techniques can also be taught to remove the stress developed in the customer service agents. Have you met the objectives of this module? Ask participants to answer all the module’s objectives that were highlighted at the commencement of the session. To close, ask participants to remember this... Â Airline passengers want more than a flight Â Hotel guests want more than a room Â Restaurant patrons want more than a meal So, why wouldn’t Health Care customers want more than just somewhere to be medically treated?